one receives far more than he seeks. I love being out in Nature. It reduces my stress because it's the one place I can go that makes sense especially in this fast-paced, crazy world we live in. Disconnecting from my phone, computer, and other electronic stimuli allow me to become a human being again. I especially love it when I come across wildlife on my walks with my dog, Bodhi. Observing wildlife brings out my childlike curiosity. I learn a lot by communicating telepathically with them like in my recent blog post, Discovering New Creatures Using Telepathy. Thanks to the abundant winter rains that ended Northern California's severe drought, the local fauna and flora are flourishing this summer. It's uplifting observing the different raptors like the Hawks, Kites, and Kestrels as they dive and grab the voles, which are meadow mice, out of their holes and fly away with their prey. The other morning Bodhi and I spied a Coyote on our morning walk in the open space near our home. This wasn't the first time we've seen coyotes. However, we've seen more coyotes this year than I can ever remember in the 25-plus years I've lived here especially in the early morning. From a safe distance, we quietly watched the majestic young Coyote as he sauntered along the trail. That is until he stopped to hunt for a vole in a hole similar to the picture below. When a wild animal crosses my path, I like to reach out to them telepathically. I understand when wild animals are too busy to communicate given they are constantly looking for food and trying to survive whatever might come their way. However, I'm grateful when an Animal or Nature Spirit takes the time out of their busy day to share their hearts with me. I always start my communication with an animal, wild or domesticated, by asking, "Is this a good time to talk with you?" If the animal says "yes," we start a conversation. If the animal replies, "No," then I thank the animal and move on. A key aspect of telepathic animal communication is to always thank the animal them after communicating with them, even if you don't feel you received a message. When you say, "thank you," it tells the animal that you respect them which builds mutual trust and understanding. Showing reverence for another living being also increases your telepathic abilities. I appreciate you reaching out to me as I welcome your heartfelt connection. While Coyotes can act non-schlant, we are keenly aware of the harshness and fear coming from the humans we encounter. For the most part, we are not interested in humans. It's all about having fun while trying to survive. Coyotes are misunderstood and vilified by humans which threaten our lives and ways of being. Like people, we are an intricate part of the web of life. We need you as much as you need us. We appreciate it when you see the world from our perspective as you see through the misconceptions that surround us and our brethren, the Wolves. While we may be perceived as the Trickster of the Animal World or killer of cats, we have as much right to survive as any other species. It can be hard when we are vilified. Yet, we don't let it bother us as we continue living our lives. It's been a good year for me and my pack given the abundance of food and water. The last few years were challenging. We are survivors and we feel stronger because of the drought. We are happy living life with a full belly. We urge people to take a break and connect with us and Nature. When our conversation ended, I thanked the Coyote for taking time out of his busy day to share his wisdom with me. As Bodhi and I continued our walk, I reflected on the message the Coyote shared with me. 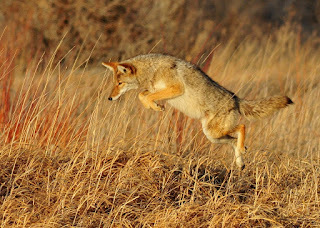 According to Native American Indian lore, Coyotes symbolize the tricksters, shape-shifters, and transformers in Nature. In this way, Coyote's wisdom or medicine teaches us about cultivating flexibility with a playful sense of humor. It's also about experiencing the magic in life while staying open to the unexpected. On a deeper level, Coyote medicine asks that we see the truth behind the illusions, misconceptions and false impressions. Coyote tends to employ trickery or deception to achieve its goals. When a Coyote crosses my path, I know it's time to lighten up and not take life too seriously. Coyote Medicine reminds me to simplify my life with a sense of humor towards whatever may be coming my way, or this Jokester may play a trick on me to make sure I'm too set in my ways. Mother Nature and her myriad of creatures have a lot of wisdom to share with humans. I hope the next time you come across a wild animal like a Coyote, you'll strike up a telepathic conversation with them to find out what inspiration and wisdom they want to convey. I loved this. So interesting to hear that wild animals can communicate with us.